Following the huge success of the Converse Rubber Tracks Amsterdam pop-up studio at Amsterdam Recording Company earlier this year, the series returns for its third instalment. From 7th – 18th October 2015, free recording time will be made available to selected local musicians. 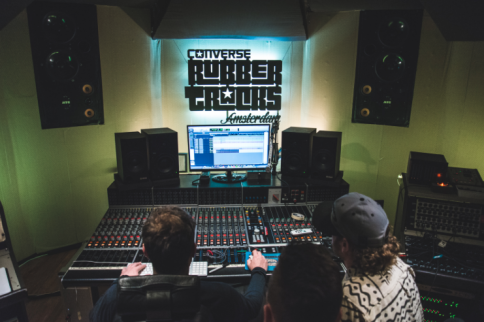 Starting today, artists can apply online from 3rd – 16th September 2015 on www.converse-music.com/rubbertracks/ for a chance to record original music with a team of skilled studio professionals as part of the Converse Rubber Tracks programme. Leading up Amsterdam Dance Event (ADE), the world’s biggest club festival for electronic music and the leading electronic music platform, the recording sessions will run for a ten-day period at the Amsterdam Recording Company located on the Java-Eiland in the north of the city. Emerging artists – curated and hand-picked by Red Light Radio – will record original music for a full day in an advanced, state-of-the-art studio under the guidance of expert technicians. Artists will retain all rights to their work. ADE will also host a special Converse Rubber Tracks Live, where an established international producer will select Converse Rubber Tracks artists to support them.